Constructed with sub angular glacial sand. Biotreatment Soil Media (BSM) (biosoil) is a critical element of the bioretention system. 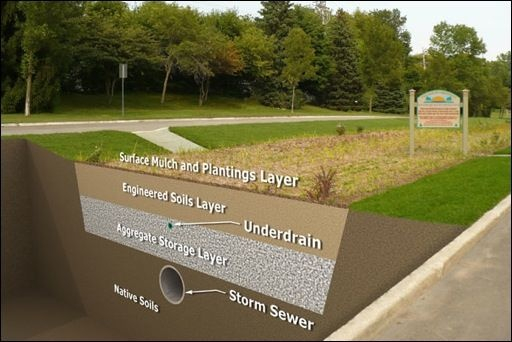 Norcal Filter Green biosoil has a ratio of inorganic and organic materials that allows the appropriate infiltration rates for stormwater pollutant removal through chemical, biological and physical processes; and provide a sufficient growing medium for plants. Norcal Ag Service’s 'Filter Green' certified Biotreatment Soil Mix (BSM) is sold in bulk and made to the specifications you need for your job. Fitler Green is the only Bioretention soil made with sub angular Glacial sand from private deposit in North America offering unsurpassed structure, effectiveness and longevity to filtration basins. Bioretention soil media orders are delivered by regular semi's or high side transfers when needed. 1. Norcal Filter Green - BASMAA certified stormwater biofiltration soil media. 2. Class ll permeable rock - Caltrans Spec. Norcal Ag Service is dedicated to making quality Biotreatment Soil Mix (BSM) to the specifications you need for your job. We have extensive experience in helping organizations engineer the soils they need to meet the wide variety of specifications for these projects. Our custom-blended Bioretention soils remove pollutants through filtration and a variety of biological and physical processes. Our soils meet Bay Area Stormwater Management Agencies (BASMA) soil specifications for Bioretention Soil media. They also meet USDA Soil Type requirements. Tested for Storm Water Infiltration Rate. Call Today for delivery pricing.